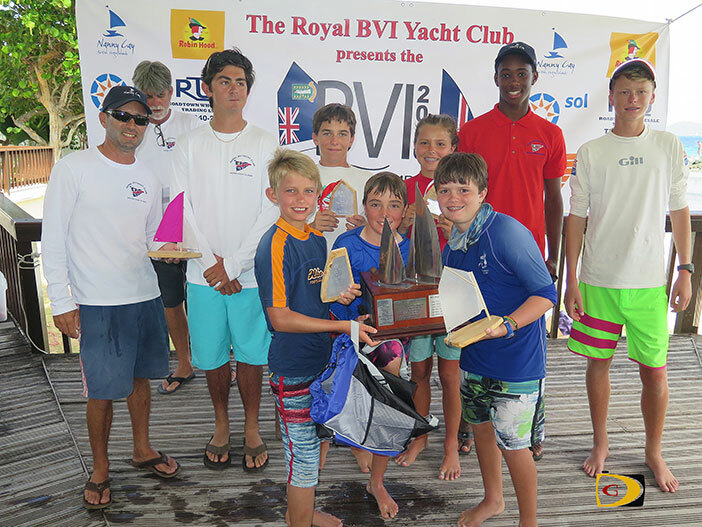 When the BVI’s Rayne Duff tied St. Thomas’ Mia Nicolosi at 10-10 on Sunday morning in the 15th BVI Dinghy Championships after she ended Saturday with a two points 6-8 edge over Duff, she showed that she wasn’t about to give up the title. A determined Nicolosi erected two more picket fences—her sixth in 11 starts—to regain the lead, before fending off Duff who won the last race of the competition for a one point 14-15 victory. By winning, Nicolosi secured her third successive win over Duff on his home soil, including September’s Back to School Regatta. While St. Croix’s Mathieu Dale sat comfortably in second, he had a bad ninth race but held off St. Thomas’ Julian van den Driessche, to finish third by a point, 54-55. Jose Arturo Diaz of Puerto Rico, was fifth with 57. Nicolosi also won the Triple Crown with 34 points while Duff was second with 43 and Mathieu Dale, third with 142.3.